Your goal with outdoor path lighting is to provide an easy passage for which traffic can move smoothly. Since people naturally flow to wherever the light leads them, path lighting helps to naturally direct them to wherever it is you want them to go. Be creative and place your path lights wherever you feel they fit best. Wide paths may require a bit of a different lighting effect. 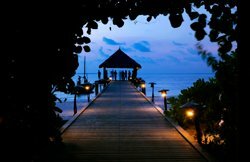 Applying down lighting or moon lighting to a wide path can produce adequate lighting while covering a larger surface area. There are many outdoor lighting fixtures to choose from. Finding path lighting fixtures that suit your tastes is the biggest challenge. 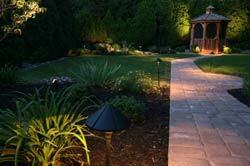 Path lighting should give your guests an idea of the underlying surface area they are walking on. If the surface is flat and smooth you won't need to over-do-it with too many fixtures. Spread your fixtures far enough apart to produce adequate lighting. You may try overlapping the light output from fixture to fixture. Avoiding dark areas will make your path look smooth and unobstructed. Having dark areas isn't the worst case scenereo. Remember, that path lighting only needs to give your guests an idea of the underlying surface area. Most people won't have any problem determining whats coming up next if your path has a consistant and smooth surface. A less than perfect surface area may require that your path lights produce more light output. More light output will highlight any imperfections on the path's surface and give people more confidence while walking on such a surface. You may even decide to add extra fixtures and overlap their light output on any uneven surfaces. This will help to produce that added amount of light needed for people to better see the surface area ahead. Adding extra fixtures will require more voltage to run throughout your setup. Low voltage transformers may be necessary to properly install these additional fixtures. Measuring your fixture's spacing can work but may not be absolutely necessary. Its ok to space your fixtures according to personal preference as long as you keep the light output consistent and not spotty. Pefect spacing on either side of your path doesn't always give off a flattering appearance. It often gives your landscape an airport runway look and makes it feel very cold and unwelcoming. It is best to spread your lights out on either side of your path and overlap the light output from fixture to fixture only slightly. Allow your path lights to help guide your foot traffic, but don't get too caught up in making it perfect. Take a mental walk along your path. Are there any focal points that you would like to highlight? Remember to let your landscape be the star of the show. Use your path lights to guide your guests to these desired locations. Use outdoor path lighting to help move traffic along while leading your guests through your beautifully lit landscape safely.